Prince of Pieces isn’t a book for the overly sensitive, or dedicated bible-thumper. In fact, those who fall into either category are probably going to declare author Sam Miserendino the second coming of Satan himself. And that’s alright, because the truth is, that’s kind of the effect Sam is going for. He wrote this – I would wager – with two separate agendas in mind. First, there’s no doubt he aimed to poke fun at those who fall under the spell of the religious swindler, and second he seems to have set out to blatantly offend those who invest every ounce of their being in a deity that we can neither see, nor physically feel. Is the man making an outright mockery of religion? I don’t think so. He is however, letting us all know that we’re clowns for banking on the devious charms of hack preachers and televangelists. Of course, this is my own personal interpretation of the book. 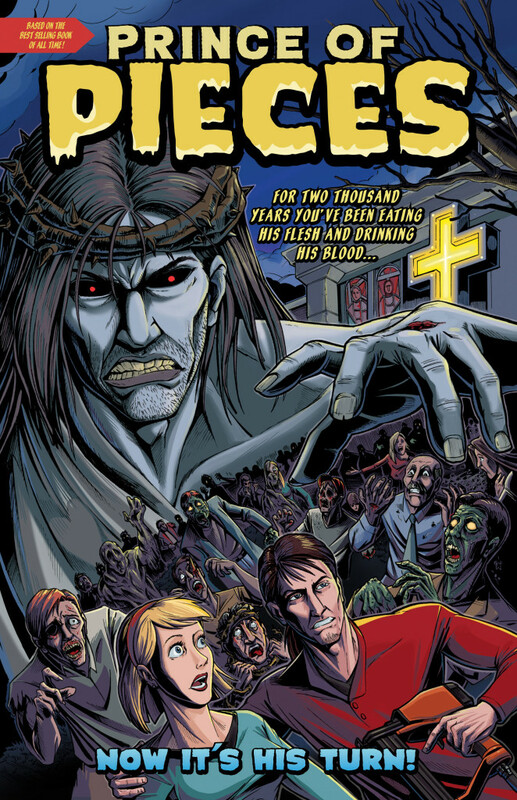 The story actually follows Jesus, suddenly risen and quite disgruntled with mankind. He’s returned to open some eyes, eat some flesh and leave the dishonorable in rotten heaps. Since the vast majority of the world’s population seem to have a crooked bone or two in their body, he isn’t too sparing when scoping victims. Jesus is obviously focused on paying the shady back, ten fold. As the book’s big pitch puts it, for two thousand years you’ve been eating his flesh and drinking his blood… now it’s his turn. The genius of the book comes in the form of numerous not-so-subtle innuendos and in-your-face assaults on the stupidity (and repulsive nature) often showcased in popular and religious culture. The snuffer over the candle that appears quite obviously phallic kind of says it all. But if you need an even clearer punch to the senses, you’ll get it when eyeballing a man of the cloth… who himself is eyeballing an alter boy. These are real life, real sensitive issues. And yet they’re so outrageous and now so commonplace that we as a society almost laugh at such situations. That’s a sad thought, but it’s true. Miserendino reminds us that it’s natural to laugh and be repulsed simultaneously. How many priests have to touch kids in improper fashion to realize a major change needs to happen? Apparently not enough. It’s such a common occurrence that it is something of a joke. Albeit a terribly disgusting one. Sam takes these kinds of ideas and uses them as a catalyst for Jesus’ onslaught. And it works. Sure it’s offensive. Sure it’s a concept that far surpasses wild. And sure it is going to rustle a few jimmies. That’s what it’s all about. And after reading Prince of Pieces, I’m glad it was Miserendino to showcase the balls to make it all a reality, because he’s a sharp, sharp dude. The comedy is gold. The brutal truth of it all is impacting. And when you incorporate Colin Blanton’s stunning artwork into the equation, it really does feel masterful. Is it blasphemous to say that? Miserendino, Blanton and Creator’s Edge have a homerun – scratch that – a grand slam on their hands. This sounds way too good to miss.